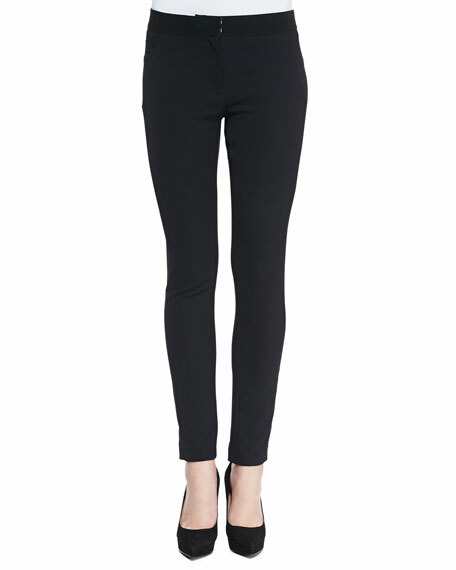 Veronica Beard leggings in scuba-style jersey. Approx. measurements: 9" rise; 10" leg openings; 27.63" inseam; 35.8" outseam (size small measured). Model's measurements: Height 5'10"/177cm, bust 31"/79cm, waist 23"/58cm, hips 33.5"/85cm, dress size US 0/2. Model is wearing size Small. Anatomie "Andrea" figure-hugging leggings with contrast panels. Mid-rise. Banded waist. Side flap pockets. Interior media pocket. Formfitting legs. Zipper cuffs. Anatomie "Andrea" figure-hugging leggings with contrast panels. Mid-rise. Banded waist. Side flap pockets. Interior media pocket. Formfitting legs. Zipper cuffs. Ankle length. Pull-on style. Nylon/spandex. Machine wash. Imported. Johnny Was "Davis" leggings in soft jersey with floral embroidery at sides. Mid-rise. Fitted silhouette. Cropped above ankles. Pull-on style. Johnny Was "Davis" leggings in soft jersey with floral embroidery at sides. Mid-rise. Fitted silhouette. Cropped above ankles. Pull-on style. Cotton/Lycra?? spandex. Machine wash. Imported. Please note: This merchandise may have a distressed effect. It is a unique feature that enhances the product and is not considered a defect.